ATLANTA…A new Lancet Commission report on mental health released today said that mental disorders are on the rise in every country in the world and will cost the global economy $16 trillion by 2030. The economic cost is primarily due to early onset of mental illness and lost productivity, with an estimated 12 billion working days lost due to mental illness every year. 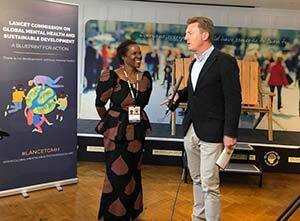 The Lancet Commission on Global Mental Health and Sustainable Development brought together 28 global experts in psychiatry, public health, neuroscience and advocacy, as well as people with first-hand experience of mental health conditions. Launched at the Global Ministerial Mental Health Summit in London, the report recommends that mental health be reframed as a fundamental human right, and that the definition be expanded to promote mental wellbeing, prevent mental health problems, and enable recovery from mental disorders. The report shows that in many countries, people with mental disorders still routinely suffer gross human rights violations – including shackling, torture, and imprisonment. Bringing attention to these kinds of abuse and discrimination, the Commission calls for a human rights-based approach to ensure that people with mental health conditions are not denied any of their fundamental human rights – not just to health but also to employment and education, among others. The report was launched during the first Global Ministerial Mental Health Summit, hosted by the UK Government’s Department of Health in London. During the two-day summit, Carter Center Board of Trustees Chairman Jason Carter spoke about U.S. efforts to ensure mental health and substance use disorders are covered by insurance in the same manner as other health conditions, such as cancer and diabetes. Jason Carter is the grandson of former U.S. President Jimmy Carter and Rosalynn Carter, a mental health advocate for more than 45 years. As young people face the brunt of the global burden of mental illnesses, the report places great emphasis on experiences in childhood and adolescence, which shape life-long mental health. The Commission has inspired a group of young leaders to launch a campaign to fight stigma, create a worldwide community, and raise awareness, targeted at those younger than 35. "We’ve seen a rise in mental illness in young people when, with all the knowledge we have, we should be seeing a decrease,” said Professor Helen Herrman, President of the World Psychiatric Association. “Treatment in hospitals needs to be complemented by care in the communities to bring mental health services to the masses”. Since 2010, The Carter Center Mental Health Program in Liberia has worked with the Liberian government to pass its first Mental Health Act and build its mental health infrastructure. The Center has trained 268 mental health professionals through the collaboration to improve access to mental health services. More than 100 of these clinicians focus on youth and adolescent mental health. The clinicians work in primary care facilities, hospitals, and other settings children frequent, such as daycare centers and schools, across all 15 counties to provide much needed care as the country seeks to strengthen its mental health services. This group of Liberian nurses, physician assistants, and registered midwives completed a free, six-month, Child and Adolescent Post-Basic Mental Health Training Program at the Tubman National Institute of Medical Arts in Monrovia, Liberia. Liberia is on course to reach its goal of expanding access to mental health care to 70 percent of the population in the next few years. Liberia’s current population of 4.6 million has three psychiatrists and plans to train more to meet the needs of at least 300,000 Liberians suffering from mental illnesses. The Child and Adolescent Post-Basic Mental Health Training program is part of a three-year initiative to address the psychological effects of Liberia's Ebola crisis and to promote psychosocial health in the country. The project, Supporting Psychosocial Health and Resilience in Liberia, is funded by Japan through the Japan Social Development Fund, a trust fund administered by the World Bank. The project is expected to reach over 19,000 beneficiaries in Montserrado (including Monrovia) and Margibi counties working through county health teams. The most recent graduating class of 19 clinicians was the last in the collaboration with The Carter Center and Liberia’s Ministry of Health through funding from the World Bank and the Japanese government. The Ministry of Health, with support from The Carter Center, will continue to train child and adolescent clinicians through the DKI School of Midwifery. The Carter Center's Mental Health Program in Liberia is supported by contributions from individuals, governments, corporations, and foundations such as the UBS Optimus Foundation. Learn more about former U.S. First Lady Rosalynn Carter’s mental health leadership. Learn more about the Carter Center’s Mental Health Program. A copy of the report and more on the newly formed Lancet Commission can be found at www.globalmentalhealthcommission.org. The Commission is being launched at the first Global Ministerial Mental Health Summit, hosted by the UK Government’s Department of Health in London. The launch event will be livestreamed at www.globalmhsummit.com from 11.00 a.m. to 11.50 a.m. UK time on October 10, World Mental Health Day.